Nesting is a funny thing. We ready-to-pop pregnant mothers have so little energy, but a buzz of unexpected, out of the blue get-up-and-go can enable us to do some hard stuff. I have so little energy right now, and the little mister inside of me is currently grinding his head into some rather painful nerves, making it hard to walk and causing my sciatic to go bonkers. Naughty boy! So moving is difficult, to say the least. But yesterday I went down into our attached garage to clean the seat where our baby will go. Vacuum up the crumbs, clean off the spill of milk from my daughter, and then hook in the base for his infant car seat. I took a big rag, some safe cleaner, and the dustbuster to vacuum up the crud and crumbs. The car doesn’t look brand-spanking new, but it’s pretty good. It’s the best that a fully-pregnant woman could do, anyway! He shook his head in exasperation, but his green eyes were soft and tender, and a little smile tugged at the corner of his mouth. Every good day must and always shall be tempered with a little excitement. We are in the middle of an aggressive potty training routine for our second son. With a fourth child on the way and him reaching three and a half years of age, we decided his relaxed comfort with where he was diaper-wise needed to be shaken up. So Sackett Man and I planned. We drew complicated diagrams and battle plans. We rendezvoused in the dark of the night and whispered together secretly. Supplies were gathered, the preparations carefully made. On Sunday we took the kids shopping. We wooed them with pasta and meatballs and breadsticks at their favorite restaurant, then we went to the store, and marched our oldest to the boy section to pick two packages of awesome underthings in just his size, and then… gasp!… our second boy was taken to the aisle where, wonder upon wonders, there were undies in HIS size! And… he got to pick his very own package! Monday morning dawned. The nighttime diaper was changed, and he was slipped into a pair of undies. He thought it was cool. 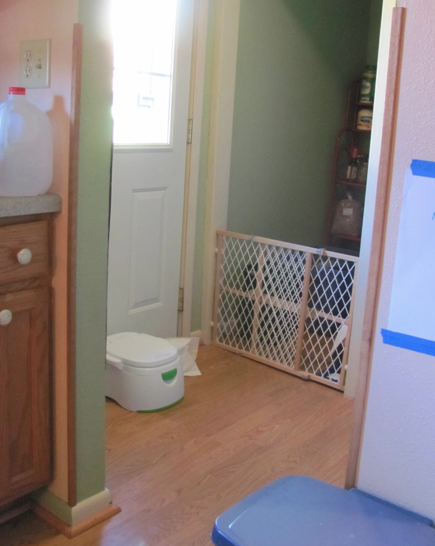 His potty chair was put in the little back room off of the kitchen, within fast and easy access as he played (restricted as he was to the dining room/kitchen area, the only place in the house without carpet). A Potty Chart was taped on the wall. Whenever he tried, he got a smiley face drawn with a red crayon. When he was successful he got a sticker on his chart and a treat (consisting of one jelly pumpkin, one of his favorite treats). It got to the point that even our youngest 16 monther would throw her hands in the air and cheer “YAY!” whenever he announced a success. We only had one accident, early on, and not again after. Must to our son’s chagrin he learned, as the day wore on and the novelty of undie-wearing wore off, that this was a permanent deal. The only diaper allowed to him from now on was his nighttime one. We had a few tears; he wanted the comfort of routine back, but I was gentle and firm that this was the new routine. I wiped his eyes and kissed his forehead, and gave him another candy pumpkin. The boys played with duplos all day, sitting together on the kitchen floor. In the afternoon I made popcorn and set up a movie on my computer for them. 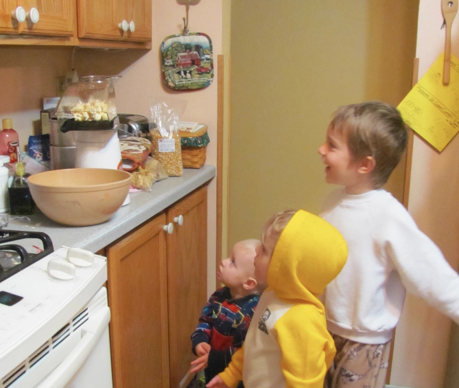 All three happily sat at the table and watched Frozen, munching away on buttery, yummy popcorn. Around 3:30 I started on supper. I pulled the thawed beef soup bones from the fridge; they still had a good amount of meat on them, so I browned them first in my dutch oven and then I added water and slowly began to cook them through, watching as a delicious broth began to form and rejoicing as the fantastic scent of rich meat filled the room. I was going to make a rustic beef stew for the night. Satisfied that all was well on the stove, I hurried off to pick some things up and put things away and organize and… well, you know, mother stuff. Sometime after four I heard James announce he’d had another success. I, with my arms full of something (I know longer remember what) quickly checked the location of my three children. All three, oldest to youngest, were back at the table watching Frozen. Good. I had time to quickly dispose of whatever I have in my arms so that I could go take care of the potty chair (this is a very important thing to take care of with all possible speed when you have a curious 16 month old). I emptied my arms and hurried to the little back room barely a minute later. Rose had beaten me to it, and was now industriously cleaning. A box of baby wipes was sitting, open, next to her, and she was crouched before the chair, scrubbing the inside of the bowl vigorously with a thoroughly-used/soaked wipe. The seat was covered with many splashes, liquid dripping and running down the sides. Rose herself was also soaked, and crouched in a puddly mess that spread out across the floor from the base of the potty chair. The soggy remains of two wipes were left in the bottom of the now-semi-dried bowl. I stood for a second in amazed horror and mind-numbing shock. My first thought was: How am I going to clean this? My second thought was: How am I going to carry her through the house to the shower? Some days require deliberate searching. You know the days I mean… the ones where one thing after the next happens till all you want to do is hide under your blanket and hope that the next day is better. Usually on days like that I end up posting about it on facebook in my ladies’ group (the members of which consist of my mom, my sister, and my sister-in-laws). When I get all of my “Why me?!! !” exclamations out, I try to then end the post with the positives of the day, which I head up with ‘The Plus Side: …”. I started this Plus Side business after a particularly fractious day. Week. Maybe even a month… I don’t remember. Anyway, I was sitting there in my doom and gloom, feeling like a terrible mother because I’d ended up yelling at the children quite a few times that day, and wishing my kids would stop their naughty behavior so that we could get back to being a happy, normal family. I’m sure some of you mother’s out there have had days like that. I was sitting there, moping, and I recalled a thing Sackett Man and I learned during a marriage counseling session. Way back when, when we were young and somewhat newly married, we found that the same trouble and problems kept popping up. Okay, they were wreaking havoc. Sackett Man and I are complete opposites… he’s a man of action, and I’m a word person. I would tell him how much I loved him, how wonderful he was, handsome, etc., etc., but I HATED doing dishes and vacuuming. So I would leave them, not till last minute, but I would push doing them out a little. He, on the other hand, would whip through the house vacuuming, mopping, folding laundry, doing dishes, taking out the garbage… but when it came to TELLING me, he would instead tell me everything I hadn’t done. Needless to say, it was turning ugly. We got counseling, which helped us see so many things and how to work at them… it was unbelievable… and honestly, now, YEARS later, I couldn’t imagine being married to anyone but him! I digress. The point of that was, one of the things we learned was the 5-1 ratio. In that it takes five good things to make up for one bad. So, if at all possible, have at least five things to say throughout the day that are positive and uplifting and encouraging to the one negative thing. So I took a deep breath, there in the middle of my brooding, paused in typing to my four confidants, and I closed my eyes. I looked back through the day, deliberately looking for the good things. I typed them out, and by the end of it I was feeling a million times better and I could see, much more clearly, what kind of a day I’d really had. Was it a good day? NO. But it wasn’t the precursor to my kids blowing up the house and running wild, either. It was just a normal bad day with a teething infant and two crabby boys. I’ve been doing that ever since. Oh no! I thought, my eyes flying open in a panic as I threw myself out of bed. Not again! See, just a month ago, the stomach flu had run through our house with much abandon and glee. Twice in two weeks. For the next hour and a half there was tense anticipation as he waited in the bathroom for the inevitable. In the meantime my second child and I were relegated to the downstairs bathroom as we got ready for the day. And… the toilet plugged. I fought with it. I argued with it. I got it free. The toilet stuck the proverbial tongue out at me, and the bowl filled to the rim… and stopped. The threat was clear: One more move and I spill over! Point taken. I backed away and shut the door. Roman, now realizing that he was not sick but had mistaken his stomach ache for SERIOUS hunger pains, happily ate his breakfast and the day commenced. Which of course meant that Rosemary cried when I didn’t hold her, and then when she was content to play on the floor she spat up all over it and proceeded to play in it with every toy she could get her hands on. My boys tried to play with the cars, but ended up arguing over who got to put what car down the ramp. They switched to a puzzle, which soon had James throwing the pieces around and Roman having a temper tantrum. Time for a bathroom break: one boy forgot to aim, and the younger one, still in training, took off his own diaper and went on the floor. The boys set up a blanket between our two couches to create a ‘tent’. I made them a snack-lunch in their two lunch boxes, turned on a nature thunderstorm album on my computer, and for the next two hours they adventured and imagined till I could almost see the the world they were in myself. It was amazing and wonderful. Rose sat in her swing and played peek-a-boo with me while I folded laundry. 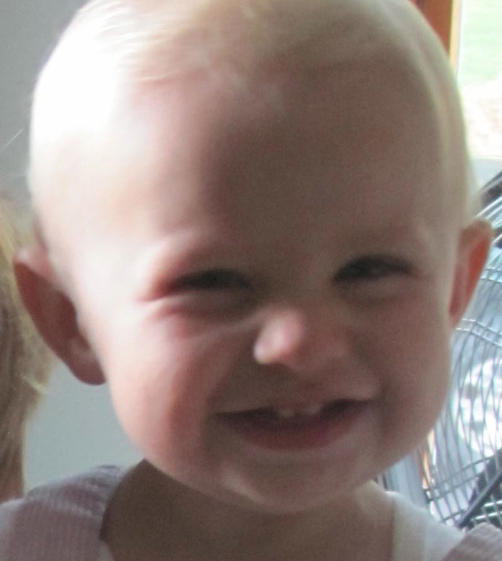 This week she’s into tossing her head back and forth as she giggles, which is a hilarious sight. Rose took a thirty minute nap. I got a basket of laundry folded, and another one in the washing machine. I have a cold, which means I get to indulge in my favorite thing: Tea with lemon juice and elderberry syrup. The perfect tonic for a sore throat. Outside, while in the negative digits, is beautiful and white with softly falling snow. 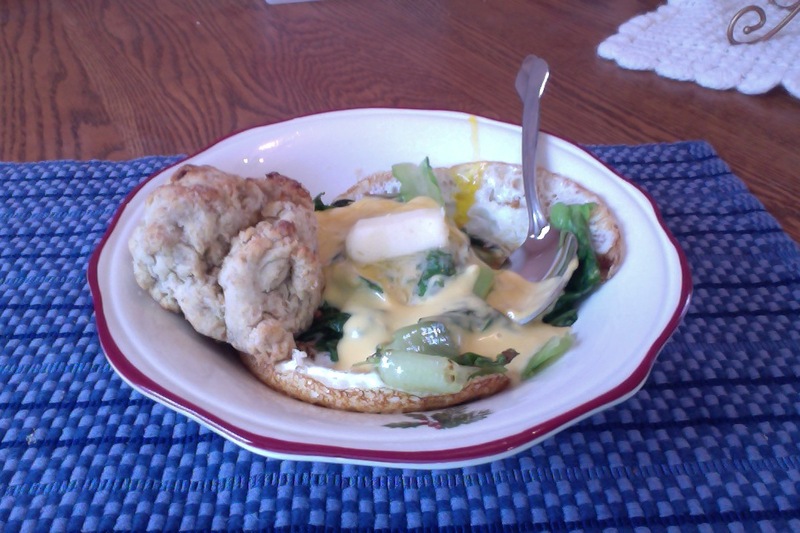 And I’m finally having lunch, which consists of two fried eggs (runny, of course), wilted greens in butter, a leftover homemade biscuit, and topped with the leftover cheese-sauce my husband had made over the weekend. Seriously, it’s so good! 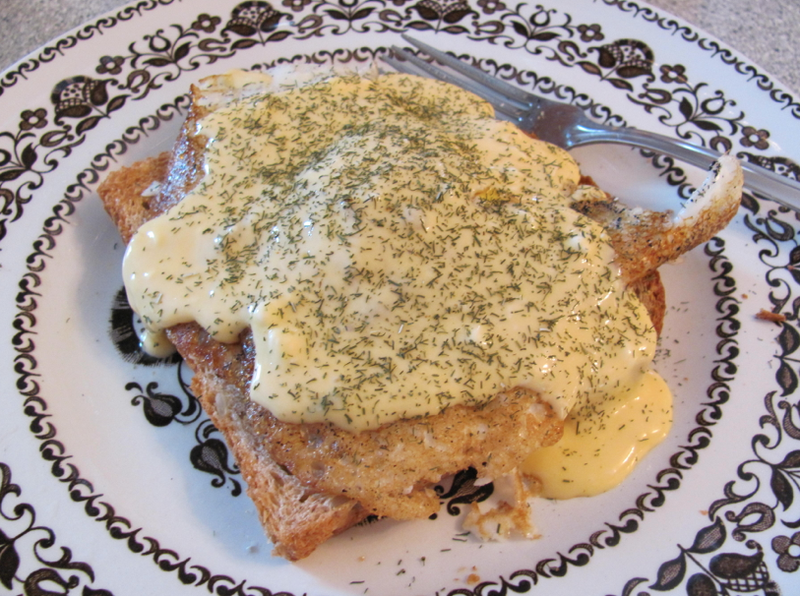 He made breakfast on Saturday, of eggs and toast and this amazing cheesy sauce that is fantastic. He layers it all, tops it with the sauce, and sprinkles it all with dill. That’s my Plus Side for a day that didn’t start great, but is getting better. My boys got to go outside today for the first time this week, bundled up like the little boy in ‘A Christmas Story’. My youngest boy, James, was in within five minutes, his little fingers so cold that his nails hurt, so I peeled him out of his winter wear and wrapped him in a blanket, curled him up on my lap, and put his fingers under my arm to warm them up. Within a few minutes he was better. Then Roman came in. Those winter adventures sure didn’t last long! Popcorn and hot chocolate and “Lois & Clark: The New Adventures of Superman” is the perfect antidote for cold fingers and toes. I put up some Christmas decorations, and folded laundry… and folded laundry… and folded laundry… I’ll get it all done, eventually. And then my kids will wear something and it will start all over again. My favorite parts of the day? I have three. The first: making and putting up colored paper chains with Roman and James. The second: being called downstairs by my Sackett Man to be shown the amazing cleanup he did down there today. Boxes and bins from the move are arranged and organized, the floor vacuumed and bleached, much of the laundry washed… He’s amazing. Third: providing a delicious supper for my tired, hardworking family, while Rosemary sat in her highchair and indulged in a saltine cracker. 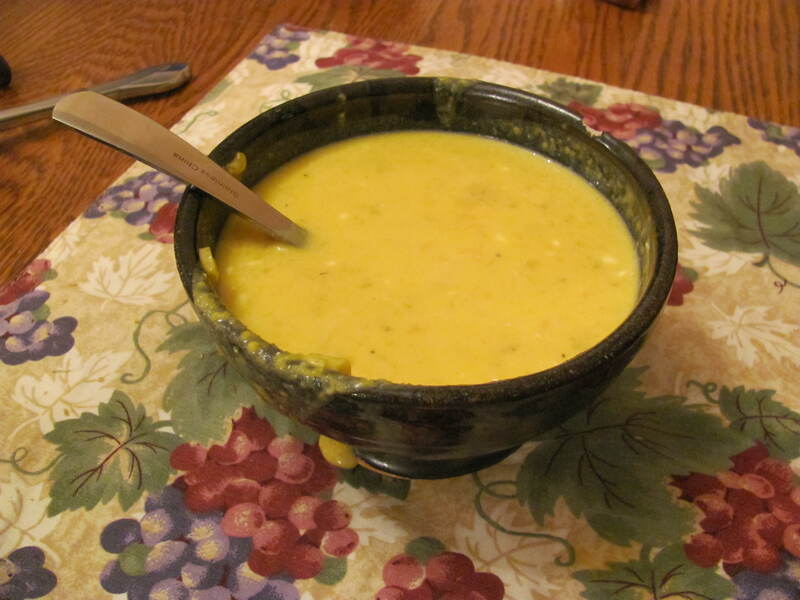 Squash soup. I use any winter squash I have on hand, cream cheese, minced garlic, thyme, butter, and s/p to taste. Everything gets mashed with my potato masher. Then I add enough of the liquid I cooked the squash in to make it the consistency I like, and voila! This is great with bread and butter. Of course, I think ANYTHING is great with bread and butter… but that could just be because I love bread. And butter.